To help alleviate long lines at Atlanta’s airport, Delta spent more than a million dollars to install a pair of new high-tech security lanes that can handle more passengers simultaneously. When even the airlines, who are happy to charge passengers extra to sit next to their family members, thinks the TSA is doing a bad job, you know there’s a problem. The innovation lanes, as Delta’s PR team calls them, still require passengers to shuffle through a metal detector—you can’t escape that part yet. 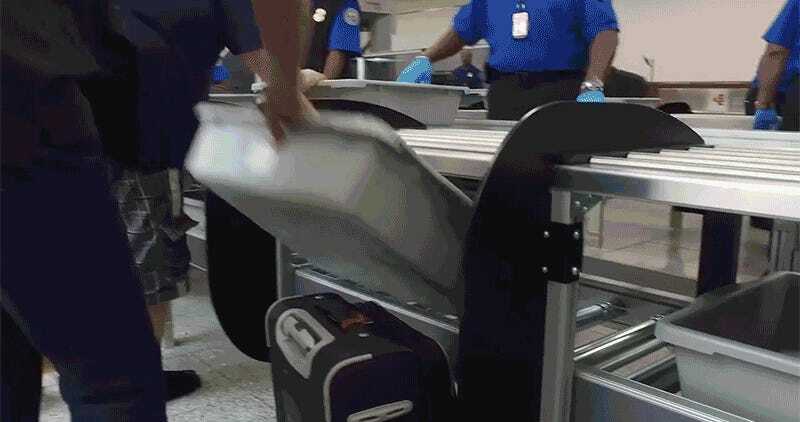 But they allow five passengers at a time to put all of their belongings into those large plastic bins for scanning, instead of the painfully slow one-at-a-time process that currently exists at most airports. An automatic conveyor system then moves the bins along into the X-ray machine, so that passengers don’t have to wait around to push them through themselves. Bags that require further inspection are automatically re-routed to another area as they leave the X-ray scanner, so there’s less confusion as to which one needs to be opened. The new innovation lanes also automatically return empty bins back to the start of the line, so travelers aren’t left standing around waiting for a TSA agent—whose time could be better spent elsewhere—to slowly stack and carry them back. Unfortunately, having just two of these installed in Atlanta will in no way resolve the problem of excruciatingly long TSA lines that exists across the country, but it might show other airports that there is a better way.